Cold and snowy weather – the type that has dominated this winter across much of the United States – can lead some people to question the validity of global warming. According to scientists, however, these frosty conditions are not entirely unexpected in our changing climate. Cold temperatures are a natural part of winter. Our astronomical seasons – winter, spring, summer, and fall – are generated by the tilt of the Earth’s axis and the movement of the planet around the sun. During the winter months, our hemisphere is tilted away from the sun and receives the least amount of solar energy all year. So, even as our average global temperature goes up, winter will continue to be cold relative to the other seasons. 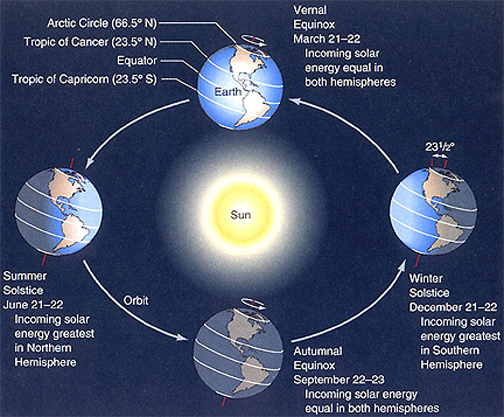 The seasons are caused by the tilt of the Earth as it rotates on its axis and revolves around the sun. Image Credit: NASA. Although global warming will not change the tilt of the Earth’s axis, it is affecting the moisture content of our atmosphere. Increasing levels of greenhouse gases are warming the air and allowing it to hold more water vapor. As a result, when storms develop they produce more intense precipitation. In winter, that includes snow, sleet, and freezing rain when given the appropriate temperature range. This year, we have experienced a number of arctic outbreaks from the now famous polar vortex. Each one provided a deep pool of cold air that helped produce significant snowfall throughout the eastern two-thirds of this country. 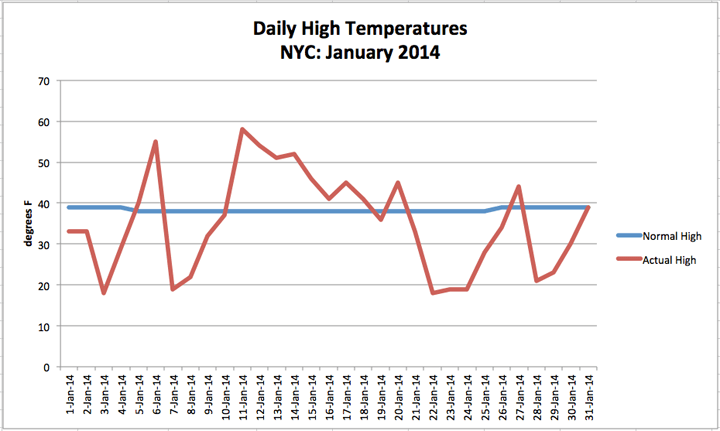 While the occasional cold snap is part of the season’s natural variability, they have been lasting longer recently. Some scientists suggest this is the result of arctic amplification – a tendency for the arctic to warm more rapidly than the mid-latitudes. As the temperature difference between the two regions decreases, the jet stream slows down and takes a wavier shape. The larger the waves, the slower they move, and the weather associated with them – warm or cold – stays in place longer. It is also important to remember that climate change is a complex global phenomenon that involves much more than what is happening in our own backyards. While it has been a brutally cold and snowy winter for many of us in the Northeast and Midwest, the western states are in the midst of a serious drought and Alaska has been experiencing record high temperatures. Beyond our borders, much of the rest of the world has been unusually warm. For example, the recent Olympic Winter Games in Sochi, Russia were the warmest in history. In the southern hemisphere, Australia sweltered through a record heat wave in early January. Experts say it is not unusual to see regional variability with climate change, but overall the Earth’s atmosphere is unequivocally warming. This short video by the Yale Climate Forum highlights the issue of cold weather and climate change in the context of the 2013-14 winter season…. A massive winter storm walloped the East Coast of the United States yesterday. The impacts of snow, sleet and freezing rain were felt from Georgia to Maine. Here in New York City, the storm came in two parts. The first round brought us 9.5 inches of snow. Coming down at a rate of 2 to 3 inches per hour, it piled up quickly. Following a lull in the afternoon, round two produced heavy rain, thunder and lightning, and another 3 inches of snow. In the end, this classic nor’easter dumped 12.5 inches of heavy, wet snow in the Big Apple. So far this February, the city has received 25.7 inches of snow. On average, we usually get 25.1 inches for the entire winter. 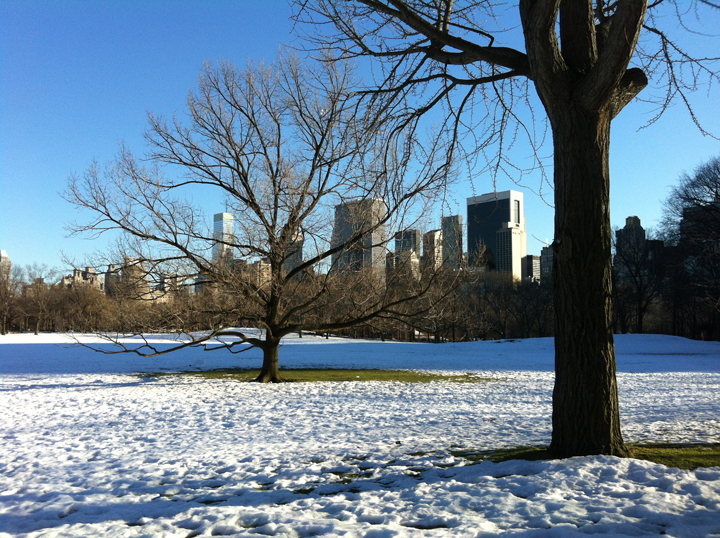 This season, to date, we have accumulated 54 inches of snow in Central Park, making it our 9th snowiest on record. Frigid temperatures and abundant snowfall have been dominating this winter season across most of the continental U.S. In Sochi, Russia, however, the XXII Olympic Winter Games have had a more spring-like feel. 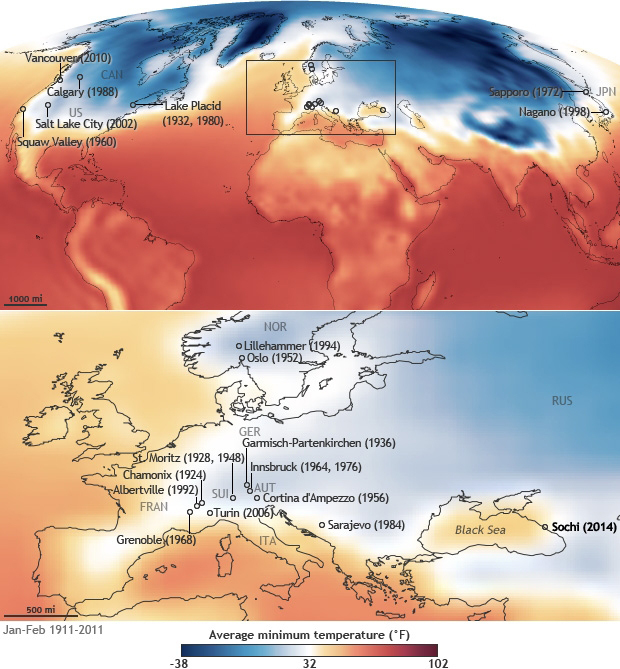 Russia, famous for cold and snowy winters, has a few relative warm spots. Sochi is one of them. Situated between the Black Sea and the Caucasus Mountains, it has a subtropical climate that supports palm trees. While there is usually snow in the mountains, the city’s average temperature for this time of year is about 50°F. This week, temperatures in Sochi have been running above average. Today, the mercury hit 59°F and highs are forecast to be in the 60°s for the rest of the week. Even in the higher elevations of the so called “mountain cluster” venue – site of all the skiing, snowboarding, and sledding events – temperatures have been well above freezing during the day. This mild weather is turning the hard packed competition snow into slush – creating difficult conditions for many of the athletes. While the current balmy weather has caused some delays, it has not hindered the Games. With hundreds of snowmaking machines and a stockpile of natural snow stored from previous years, officials say they are prepared to supply as much snow as necessary. That said, these Winter Olympics are on track to be the warmest in history. Average minimum temperatures for January and February from 1911-2011 for all the locations that have hosted the Olympic Winter Games. Image Credit: NOAA. Winter, like all seasons, has its pluses and minuses. With freezing temperatures and accumulating snow, it can produce travel problems and other difficulties. On the other hand, it also creates the opportunity for a variety of outdoor activities like skiing, sledding, ice-skating, snowshoeing, and of course, the Winter Olympics. 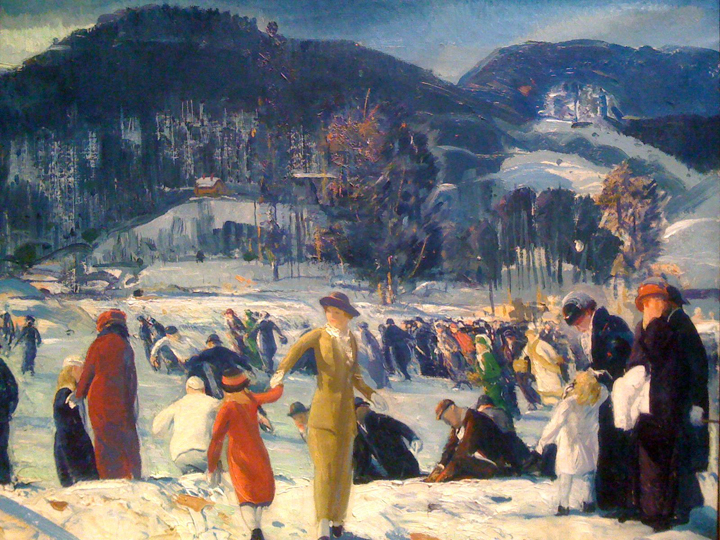 Love of Winter, a painting by George Bellows from 1914, captures the spirit of those who embrace the season. A personal favorite, it portrays the movement of skaters on a frozen pond. Filled with activity and color, the scene conveys the joy of being outdoors on a crisp winter day. Love of Winter, 1914 by George Bellows. Oil on Canvas (32.5 x 40.5 inches). The Art Institute of Chicago, Friends of American Art Collection. Coming on the heels of a very snowy January, a series of winter storms slammed the midwest and northeastern U.S. this week. From snow to sleet to freezing rain, the region saw a bit of everything. Here in New York City, Monday’s storm dumped 8 inches of heavy, wet snow in Central Park – setting a new daily snowfall record. Only two days later, another weather system brought the Big Apple a wintry mix that included 4 inches of snow topped with about 0.25 inches of ice. These two storms brought the city’s monthly snowfall total up to 12 inches and it is only the first week of February. On average, we usually receive 8.8 inches for the entire month. Overall, local snowfall has been running above average this winter season with 40.3 inches of accumulation to date. While more snow is on deck for the weekend, NYC is not expecting significant accumulation, contrary to earlier reports. Today is National Weatherperson’s Day in the United States. 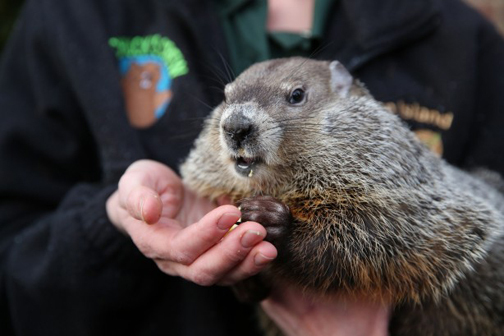 Observed annually, it is a day to recognize the work of all individuals involved in the field of meteorology – not just famous prognosticating groundhogs. According to the NWS, February 5, 1744 was the birthday of Dr. John Jeffries – one of America’s first weather observers. As a Boston based physician with a deep interest in weather, he kept daily records from 1774 to 1816. He also took the first known weather observation from a hot air balloon in 1784. Recognizing the significant contributions Dr. Jeffries made to the science of weather, this day was chosen in his honor.